As reported by the Associated Press, May 5th 1981. A volcanic eruption which sunk a small South Pacific island may also have sunk the fortunes of one of America’s most celebrated millionaires. After weeks of oceanic tremors, scientists confirm that a volcano erupted on the island of Palu Makalu, popularly known as “Gilligan’s Island” since the discovery and rescue of the survivors of the S.S. Minnow shipwreck in 1978. The island is now submerged in the depths off the continental shelf. 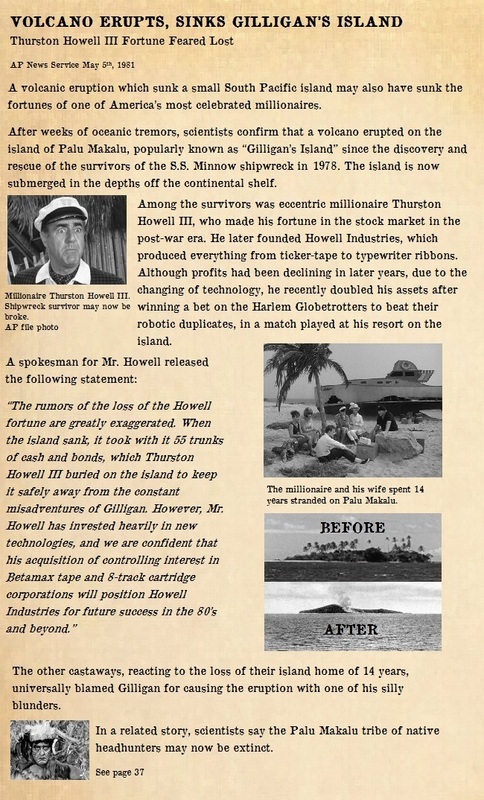 Among the survivors was eccentric millionaire Thurston Howell III, who made his fortune in the stock market in the post-war era. He later founded Howell Industries, which produced everything from ticker-tape to typewriter ribbons. Although profits had been declining in later years, due to the changing of technology, he recently doubled his assets after winning a bet on the Harlem Globetrotters to beat their robotic duplicates, in a match played at his resort on the island. The other castaways, reacting to the loss of their island home of 14 years, universally blamed Gilligan for causing the eruption with one of his silly blunders. In a related story, scientists say the Palu Makalu tribe of native headhunters may now be extinct. Want more Classic TV? Click the CLASSIC TV tab on top of the page. Or click right here!